Endangered, Eliot Schrefer’s first encounter with great apes in the heart of Africa, was filled with troubling tropes and stereotypes excoriating humans (Congolese, that is), but also leveled against apes themselves. Schrefer, it seems, borrowed some pages from Conrad’s Heart of Darkness to create a fiction in which the heroine, Sophie, is constantly endangered by humans and finds solace only in the jungle, among great apes. 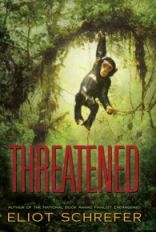 In Threatened, a sequel to Endangered, Schrefer sets out to rectify his treatment of chimpanzees. He confesses in his notes that Endangered gave a “bad rap” to chimpanzees. But after reading Jane Goodhall’s study about apes, Schrefer came up with a different and more empowering fiction. Apes, in Threatened, are gentler, smarter, and less cruel, because here, as opposed to Schrefer’s previous ape fiction, we find them in their natural habitat, deep in Gabon’s pristine and dense rainforest. The narrator, Luc, a young orphan, lives in Franceville, which Schrefer describes as an urban jungle, with only one hotel with painted walls, a forlorn town where bill collectors chop the hands of child thieves in the middle of “Independence Square” with the police watching the whole scene without intervening. Luc would have probably suffered a similar fate had it not been for Professor Muhammad, an Egyptian primatologist, who came to Gabon with the ambition to become the next Jane Goodhall, an African Jane Goodhall. Prof, as Luc calls him, rescues the young orphan from the clutches of a nefarious child abuser, Monsieur Tatagani, who terrorizes a group of orphans under his care. Prof, whose academic credentials we come to find out are as nebulous as the character himself, shows little sympathy for African orphans. He is only concerned with one mission, to protect the threatened chimpanzees. With that mission in mind, he hires the young boy to serve as his assistant and ventures with him into the jungle to observe and study chimpanzees. They settle in the jungle, battle the elements, face creeping animals, and confront their own fears and doubts. Prof falls ill and, one night, disappears mysteriously from the campsite. Luc is left alone in the forest with Prof’s monkey pet, Omar, and decides to stay rather than to face hardship back in Franceville. Schrefer’s conservationist tale never shies away from the notion that “our treatment of animals is a great failure to our empathy” (p.51) and that humanity cannot thrive at the expense of a species that is closer to us than it is to gorillas and other apes. Yet, the story lacks the griping plot of Endangered. This is, perhaps, because, it does not just revolve around chimpanzees but describes the curious relationship between an old westernized Arab professor and a young, uneducated African orphan, a relationship initially beset by misunderstanding and mistrust but which gradually develops into a friendship as the two protagonists discover one another’s painful past and are united in their determination to save the apes. Schrefer is undoubtedly a great writer; his book is well written and easily accessible to young readers. His conservationist message, however, lacks the kind of clarity and poignancy to pull readers into the narrative and spur them into action. Prof and his young acolyte ventured inside the forest to study chimpanzees, but exactly what that entails is never truly elucidated. Finally, the juxtaposition between the African city, described as a postcolonial Cronos devouring his own children, especially its youth, and the African forest, depicted as a green sanctuary where young Luc finds solace, conveys yet again afropessimist tropes that harken back to the darkest day of European colonialism in Africa. Most sequels rarely manage to capture the authenticity and inspiration of the original work. Threatened is no different. Threatened is a gripping adventure story of survival in the wild. The character traits and experiences of the protagonist, Luc, are juxtaposed against those of the chimp family he befriends (Drummer, Beggar, and Mango) to highlight the similarities between the two species. The story is well structured to point out their need for companionship, family relations, and the emotions of fear, anger, aggression, and self-preservation. The weakest aspect of the plot is the role of Professor. His dubious credentials as a wildlife expert and the mystery surrounding his personal life are not resolved or explained adequately. He seems to be inserted into the story as a strategy for rescuing Luc from “slavery” in Franceville and relocating him to the remote forests of Gabon. Even his work in observing the chimps does not ring true: he is the expert, yet we learn very little scientifically from him. While Luc acknowledges that Professor has taught him some general facts about chimps, we do not witness the professor engaged in serious research or observation of the chimps. In addition, what is the purpose of making him an Arab who purchases goods and services with counterfeit money? Apart from showing that he is cunning and a cheat, these details seem to discriminate against Arabs and reinforce stereotypes. Like a typical adventure story for young people, everything works out well for the protagonist and he lives happily ever after. However, the story does not end with the “rescue” of Luc. When the Western journalist/humanitarian braves the wild to photograph and write a story about Luc, she offers him several temptations to leave Africa for the West — a better life, education, material things, celebrity status, opportunities to help the chimps — but Luc is firm in his resolve to stay with his chimp family and to preserve the purity of their lives. Also, he is proud of his country, Gabon, and of researching the chimps. On the personal level, he feels fulfilled and happy because he finally has a family. Threatened certainly engenders respect for the chimps and their strategies for communal organization, but how plausible it is as a story of animal conservation is questionable.